Vermeer sired fifteen children, eleven of whom survived infancy. At least seven of these surviving children were female. The adult woman seen in several of his paintings is obviously his wife, Catherine. A few items have their maid, Tanneken Everpoel, at her side (or, as in The Milkmaid, going about her duties alone) Most others, after the first few paintings featuring tavern life, I believe featured one daughter or another. His most famous model, the adolescent girl with the oriental headdress, or, if you prefer, Girl With a Pearl Earring, is either one of his oldest daughters, Maria or Elizabeth. I believe she is the same person in The Girl Writing a Letter. To say The Girl Writing a Letter has alopecia is a bit rich but she has a high forehead even in the style of the day, and perhaps judged more favorably for it. 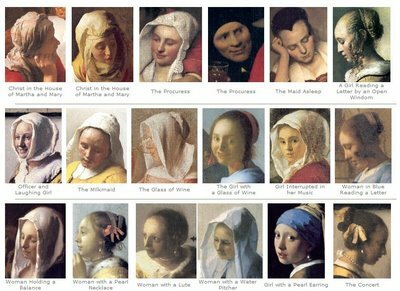 The girl with the pearl earring indicates no particular hairstyle. One can assume she has hair under there. 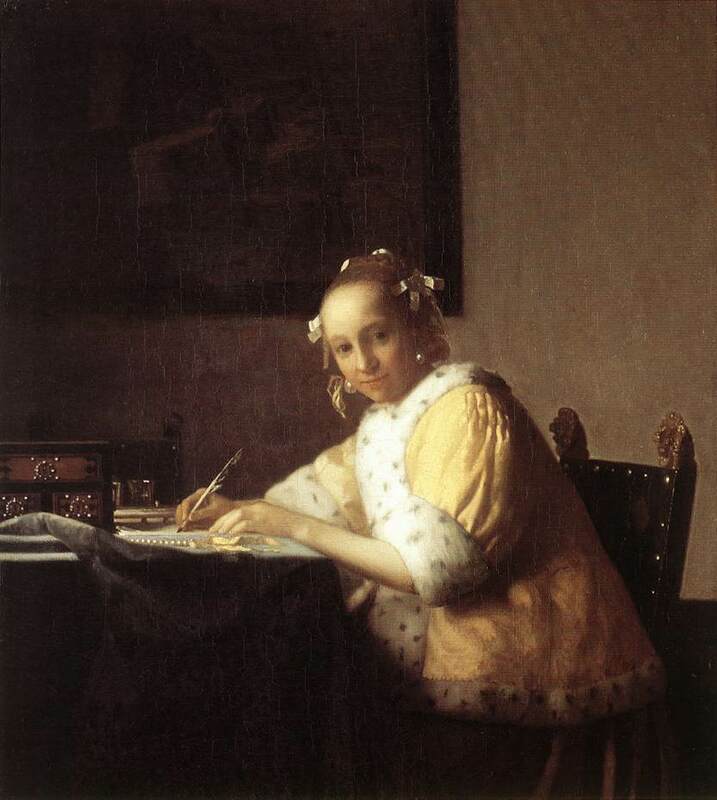 The painting of the letter writer- I see this portrait as an advertisement for a marriage-aged daughter in an overcrowded house as much as a demonstration of skill for potential commissions or covering a favorite subject then in vogue: Female letter writers (You got me). Otherwise, I’m not sure what the point of the painting is. I’m certain the man loved his daughters and was happy to bestow a certain immortality by essaying them in paint; that, though, is the kind of romance I bristle at when on the one hand you have a professionally trained painter trying to make his substantial financial nut through his talent, but at the same time finding time to pose his daughters for posterity. It’s not impossible to accept such sentiment, but if Vermeer painted so few pictures and some are for the family album then the argument that he spent most of his energy as a copyist gets stronger. I suspect with this item he was killing two birds with one stone. He was employing his readymade model daughter in pursuing the trends of the market, and bringing awareness to the locally affluent that this creature is quite a catch. Here a girl of maybe fifteen shows her varied aspects: the maternity coat drops a lead sized hint she’s fertile and maternal. The quill pen states firmly that she is literate. The coquettish ribbons position her age and support her assumed virginity. The desk and the welcoming look suggest more book balancing than penning a personal note, indicating a certain efficiency at running a household full of future children. Finally, the painting on the wall includes flowers and musical instruments (trust me). 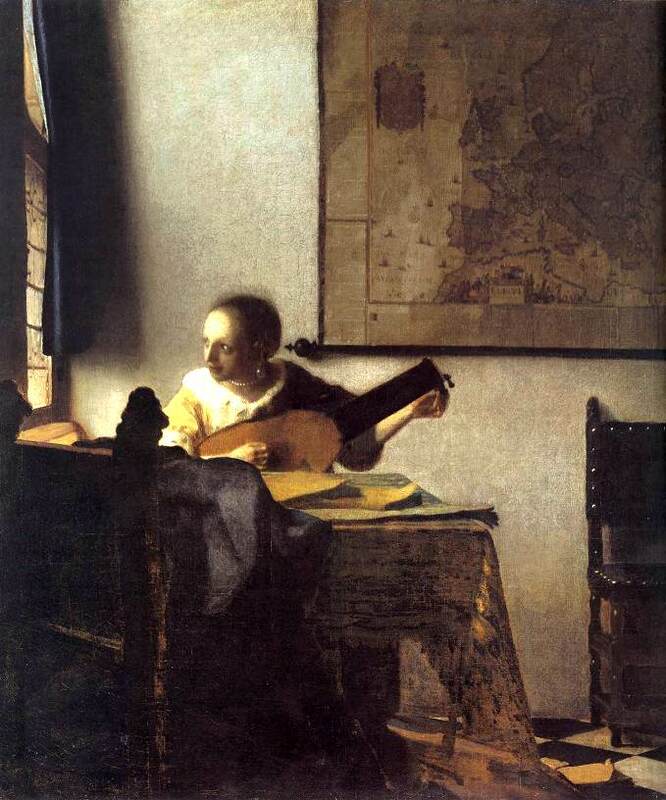 Given how much musical performance goes on in Vermeer’s pictures, this is another item to list in the girl’s favor, that she’s also musically literate, a real plus in the eons before recorded music. The sitter for the pearl earring- noted in recent years as the Mona Lisa of the north- is doing nothing more than holding a pose so her father can execute a “tronie”, a demonstration piece, an exercise definitely made for potential commission requests to asses the skills of the artist; patrons who would want specific family members immortalized in paint. A great deal of noise has been made about the information gathered from x rays pointed at this painting, the result being that there is nothing but paint on the canvas, no underlying drawing. I believe it- a very fine tipped brush dipped in a neutral shade of something like burnt umber or chrome yellow can, with a quick hand, do the same in paint that a stick of charcoal or pencil lead can do. Glazes of varying density in the same neutral range can fill shaded areas of the face in a matter of minutes. This template of light and shadow would then guide the build up of color that would only require periodic attendance by the model. 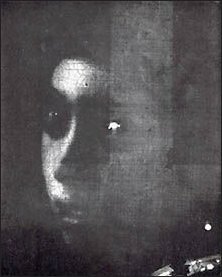 The model would likely be repositioned through a grid on a piece of glass set between the model and the projection onto the canvas by the lens of the camera obscura. Even a chin rest could be set to keep the head in place, which obviously the painter would not include in the finished product. I’ve tried variations on these techniques and though a neophyte would have some trouble, after a time the hand and eye pursue only the necessary information and the efficiency of a painting like this one becomes possible to imagine without infusing the artist with supernatural skills. This dash off of his daughter was a sterling example of a veteran with finally honed instincts. The vague intent of the sitter is also a by-product of Vermeer pinpointing the essentials and leaving out obsessive detail. Try to imagine a fashion photographer showing his portfolio and presenting highly detailed close ups of rugged or wrinkled family members with admittedly compelling character rather than softly focused, idealized beauty that the magazine actually wants. This gossamer beauty with the pearl earring has, in effect, been airbrushed. This tronie was part of Vermeer’s sizzle reel. Woman With a Lute is the same girl as the letter writer. Why she’s tagged as a woman is beyond me- she looks about fourteen- the girl with the high forehead again (and the ubiquitous pearl earring.) At this point, that earring is starting to look like nothing more than a device, a prop to give the shadowed side of the face a spot of light. It’s a good trick, and frankly no one was assessing Vermeer’s technical schemes in whole, save himself. So what if that damn earring suggests there’s only one earring in a whole house full of females? A painter can fetishize like no one else when they get to liking a gimmick. 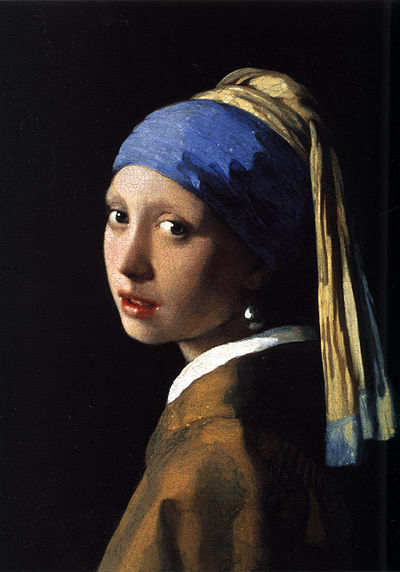 I also wonder about the ermine trimmed yellow jacket that is as popular for Vermeer as his earring. Is this the best piece of glad rag they had? The repetition of elements in the oeuvre suggests there may have been very little to spruce up the pictures and this, too, may account for the lack of interest from the buying public. I have to wonder that if one painting of a woman in yellow and pearl isn’t selling, why keep at it? Next Next post: Did Those Uruguayan Rugby Players Really Start Eating Each Other? Girl writing a letter, if I can be so in the present, first thing I think is she is got her hair in rollers, and second … yikes! Run away!